Trevor Goddard began his Test career with men who had started their First Class careers before the Second World War. It ended in a different age, surrounded by prodigious young talents like Barry Richards and Mike Procter. He bowed out after the third match of the series South Africa won 4-0 against Australia in 1969/70, the country’s last series for more than 20 years. It was an emotional farewell for one of the most popular men to have played for the country. Many would have liked to see him retained for the final match of the series but, at 38, he had signalled his unavailability for the forthcoming tour of England, and with the Australian series won the selectors decided that there was no room for sentiment. There must however have been a more appropriate way of breaking the news to a man who had just taken 3-27, than for him to simply see on returning to the pavilion that his name was not on the team sheet for the final Test. That they were later at pains to thank their for former skipper for past services, and to make it clear that had he been available for England, or if the series were still in the balance, he would undoubtedly have been selected for the final Test hardly made up for their earlier lack of consideration. There are many cricketers from Goddard’s era and earlier whose reputations are barely recognised today, and in some ways it is surprising that Goddard seems to buck that trend. It is not as if there was anything spectacular about the way he played the game, and in purely statistical term his record is unremarkable. He played for his country 41 times as an all-rounder. There were 2,516 runs at 34.16 including just a single century. With the ball there were 123 wickets at 26.22, and the remarkable statistic of an economy rate of 1.64. Only two men can better that figure, and neither played anything like the number of Tests that Goddard did. He was no dasher with the bat either. The lack of certainty about the number of balls faced prevents a proper comparison of scoring rates over the history of international cricket, but there won’t be too many who have scored as many runs as Goddard and who have done so more slowly. In fact Goddard came close to not having a Test career at all. In his second season in the First Class game he became increasingly disillusioned with his role in the Natal side, batting down the order and, as he saw it, being used as a fill-in bowler and he might have left the game had he not been offered the opportunity to open the batting against the touring New Zealanders in 1953. The 22 year old did not achieve a great deal in that match, but he stayed at the top of the order for the next fixture and 174 against a Western Province attack that contained three Test bowlers made the opening slot his own. As a batsman Goddard was a model of orthodoxy in terms of playing with a straight bat, and his minimal backlift exaggerated the image of a batsman becalmed. Tall and gangling the dour image was reinforced by the austere expression that intense concentration brought to his face. Unusually Goddard batted and bowled as a southpaw. He was strictly medium pace, and metronomically accurate. His standard line of attack was to tuck the right hander up for over after over and wait for a chance in the leg trap, but Goddard could move the ball the other way when he wanted to, and was certainly no one trick pony. A useful close catcher as well his Test career brought him fifty catches, mostly at slip or short leg. In 1955 South Africa toured England and Goddard’s form was such that he was an easy choice for the selectors. The bare bones of the series suggest it was an exciting one, all five Tests producing a definite result. In the first two Tests ‘The Typhoon’ blew and South Africa went 2-0 down, but they got Tyson’s measure in the end and pulled it back to 2-2 before losing the decider at the Oval. But in truth the cricket could be turgid, by way of example the third day of the first Test saw almost a full six hours play yet the second half of the South Africans’ first innings and the early part of the follow on produced just 144 runs. For Goddard personally there wasn’t a great deal of cheer in the first Test, and although he took seven wickets in the second he was struggling with the bat against the England pace attack. His own fortunes however turned with those of his country in the third Test. He began with three wickets in an England first innings which, despite a fine solo effort from the now veteran Denis Compton amounted to only 284. He then recorded his first ever Test half century, 62 all told, as he and Jackie McGlew set South Africa on their way to an imposing reply of 521 with an opening stand of 147. The fourth Test followed a different pattern as this time the South Africans began with a disappointing total, 171. England’s response depended once again on Compton but although he top scored again it was only 61 this time, and the lead just 20. Goddard and McGlew cleared those arrears as they put on 176 in four and a half hours. They eventually totalled 500 and left England 481 for victory in the best part of a day and a half. It wasn’t quite as hopeless a task as it looked as Peter Heine was unable to bowl on the last day leaving South African skipper Jack Cheetham with just three front line bowlers. At one point Goddard had bowled 46 consecutive overs, and he ended up bowling 62 overs, 37 of them maidens, and his 5-69 were the major factor in South Africa’s victory. After a second five wicket haul from Goddard in consecutive Tests the South Africans would have been hoping for a first series win in England since 1935 as they set out in response to the home side’s disappointing 151, but they had no answer to Lock and Laker on home territory and England won comfortably in less than four days. In its summary of the tour Wisden drew attention to Goddard’s defensive qualities and added, presciently, much more may yet be heard of him, he was obviously a cricketer of great possibilities. Less than two years later the two countries met again in South Africa and the pattern was similar. Despite some extraordinarily slow cricket (on the third day of the final Test South Africa scored just 122) this time there were four positive results. Again England won the first two Tests. This time the third was drawn, and South Africa levelled the series by taking the fourth and fifth Tests. Goddard was less successful with the ball than he had been in England, although he chipped in regularly and took 15 wickets (as opposed to 25 in England) but his stranglehold on the batsmen was even greater – he conceded just 1.28 runs per over. With the bat it was just two half centuries again, but he was also twice dismissed for 49, and he was as circumspect as ever. In the go slow at Port Elizabeth he batted for 193 minutes for 30. That contribution was crucial to South Africa’s victory though. South Africa’s success ground to a halt at that point however. Their next action was another home series, this time against Australia in 1957/58, and after that there was a visit to England in 1960. Both series were lost 3-0. Against Australia Goddard’s bowling was as economical as ever, but he lacked his previous penetration and took just seven expensive wickets. His batting remained consistent however. Again there were a couple of fifties, and a new high score of 90 to go with a series average of in excess of 35 for the first time. In England Goddard’s bowling was in the ascendancy again as he took 17 inexpensive wickets although by his own standards he leaked runs, going for more than two runs an over, albeit only just. With the bat however he certainly went backwards, struggling along with his teammates against Statham and Trueman at their best. In the final Test however he finally got going and might have got his first Test century. As it was he was out, in controversial circumstances, for 99. He should already have been dismissed, having been put down three times after getting to 86, and he was finally given out to a slip catch by Colin Cowdrey after more than six hours at the crease. In order to take the catch Cowdrey had to dive to his left and in scooping the ball up close to the ground he rolled over obscuring the view of many. Goddard, most certainly a ‘walker’ stood his ground impassively. He was clearly confident then, as he remains to this day, that Cowdrey had not taken the catch cleanly. Also unconvinced was the umpire, Eddie Phillipson, and it was only after a consultation with his colleague at square leg that Goddard was given out. Both The Cricketer and Wisden refer to a spectacular catch, and the umpires conferring, but betray no hint of controversy. The English press at the time were unanimous in their praise of the quality of the catch and the incident does not even merit a mention in Cowdrey’s autobiography. To a man though the South Africans were convinced that Cowdrey knew he had not completed the catch, and took the view that he was, in claiming the catch, remembering an incident in Australia in 1958/59 when he himself had been the victim of a similar miscarriage of justice. Times were changing in South Africa at the beginning of the 1960s and in 1961 the country left the British Commonwealth. The liberal option in South Africa was gone and the English speakers had no real choice but to align themselves with hard-line Afrikaaners. Goddard retired from Test cricket on his return in 1960 in order to concentrate on his career as a draughtsman, and he contemplated moving to England, spending one summer as a professional in the North Staffordshire League. He missed the visit of New Zealand to the Cape in 1961/62, where the visitors unexpectedly took a share of the series. There had been a changing of the guard in South African cricket after the 1960 defeat in England and the young side that was due to visit Australia in 1963/64 was expected to be roundly defeated by Bob Simpson’s team. The first choice as captain was experienced batsman Roy McLean, but he was not available, and Peter Van Der Merwe did not fancy making his Test debut as leader of the side, so the selectors approached Goddard who had by now returned, and had had a fine domestic season with both bat and ball in 1962/63. He accepted the offer and led his side from the front. With a little more self-belief they might easily have won the series. As it was they emerged with great credit from the 1-1 draw. The first Test was notable for the single over bowled by Ian Meckiff before his removal from the attack and the end of his career. The match was drawn, comfortably enough after a solid Australian start, but the beginning of the South African reply was interesting. Goddard opened up with Eddie Barlow, generally a pugnacious and aggressive batsman. The pair put on 76 before Goddard was dismissed. He scored 52, in a little over 90 minutes with seven fours thus outscoring Barlow by more than two to one. Perhaps leadership had brought with it a change of outlook? If it had it didn’t last. The South Africans were easily beaten in the second Test with Goddard achieving little, but in the third they hung on for a draw again, the major factor being Goddard’s batting. In the first innings he occupied the crease for three hours for 80, and in the second four and a half hours for 84. It was the fourth Test that South Africa won. In the first three Goddard’s bowling had been largely ineffective. He had bowled with his usual economy, but had not given himself the long spells of old, and he had taken only three wickets. But he was South Africa’s best bowler at Adelaide and his 5-60 were the primary reason he was able to restrict Australia to 345. The captain then had to sit back and watch as Barlow and Graeme Pollock put on 341 in the course of the side compiling 595 in reply and eventually running out winners by 10 wickets. The final Test was another draw, but the visitors had the best of it. Goddard invited Simpson to bat on winning the toss and would have been happy enough to see them dismissed on the second day for 311. South Africa then batted well into the fourth day to secure a lead of exactly 100, Goddard leading from the front with a four hour 93. The Australian second innings was attritional stuff and when the ninth wicket fell at 225 South Africa were looking like winners. But leg spinner Tom Veivers had other ideas and after coming in at the fall of the sixth wicket he spent the best part of two and a half hours scoring 39 and carrying Australia to 270. Today’s Proteas would doubtless fancy their chances of getting to 171 in 24 eight ball overs, but Goddard and Barlow do not seem to have attracted any adverse criticism for batting out time. Goddard must have regretted it though, as in the three match series in New Zealand that followed when faced with a similar situation he did change his batting order to give the more aggressive men their head. 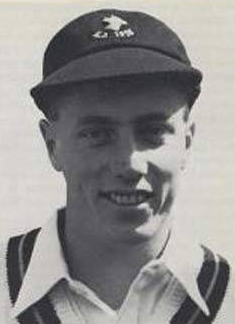 Given that in the first Test Goddard’s side contained six debutants, and that of the 75 caps the other five had between them 61 were accounted for by Goddard and John Waite, it was a remarkable performance. Goddard had averaged more than 60 with the bat and if his bowling had been less effective than in the past it had still made a big contribution to the victory in the fourth Test. His side should have won in New Zealand as well, the South Africans being well on top in all three matches when they were left drawn. After his success in Australia it was not surprising that the selectors believed that Goddard was the man to lead South Africa against England in 1964/65 and he was appointed for all five Tests. In a series that was at times ill-tempered England won the single Test in which there was a definite result to take the series. There were just six wickets for Goddard, but he averaged 40.50 with the bat and finally reached the landmark of his first Test century, 112 in the fourth Test which, had it not been for an effort by Geoffrey Boycott that was right out of the Goddard textbook, would have levelled the series. It would be wrong to describe the innings as out of character, but there were three sixes to go with ten fours, but the innings did still take more than four hours. Despite being appointed for the whole series in the course of it the selectors did ask Goddard to stand down, the stated reason being that the captaincy was adversely affecting his batting. Rightly judging that his position was one of strength Goddard refused, and then perversely was invited to lead the 1965 party that were due visit England in the second half of the 1965 summer. He declined, not wanting to make another long overseas trip, and retired for the second time. Van Der Merwe was appointed skipper in place of Goddard and he brought a hard edge to the captaincy vividly illustrated by an incident that occurred in the 1964/65 series. England skipper Mike Smith was adjudged to have been run out whilst out of his ground. For want of a better word he was “gardening” at the time. Goddard withdrew the appeal immediately and called his opposite number back – the man who threw down Smith’s wicket was Van Der Merwe. The Australians visited South Africa in 1966/67. The selectors were happy with Van Der Merwe’s captaincy after his victory in England, but despite some moderate domestic form there was still a feeling on high that Goddard had something to offer, and for a second time he was coaxed out of retirement, and clearly had no difficulty in playing under a man whose sense of fair play was certainly not as highly developed as his own. The series was a resounding success with the home side winning 3-1 in the five match series. Goddard’s form with the bat was, until the final Test, disappointing. He averaged just 23 going into the last match which is nowhere near good enough for an opener, particularly as Barlow too had a lean series. The burden thrown on the middle order was a heavy one, but Pollock and Denis Lindsay had little trouble carrying it, and then in the final Test Goddard’s twin half centuries, 74 and 59, were the foundation on which his side’s third victory was built. Goddard’s bowling, which had gradually lost effectiveness under his own captaincy, was a revelation under Van Der Merwe. He enjoyed his best ever series with the ball, 26 wickets at 16.23 being markedly superior to the returns of Mike Procter, Peter Pollock and Barlow. In the first Test, a remarkable game, Goddard recorded the best figures of his career as South Africa thumped their visitors by 233 runs. It had looked very different on the first morning when the home side slumped to 41-5, but in the second innings all their batsmen bar Goddard supported Lindsay in raising a total of 620 and then Goddard, clearly not wishing to be left out, had figures of 32.5-14-53-6 as Australia crashed to defeat. Goddard was 35 by now, but did learn a new trick. The trademark accuracy was still there, but the inswingers to a leg trap were a thing of the past. In 66/67 Goddard’s line was just outside off, straight down the corridor of uncertainty, and his ability to move the ball both ways reaped him that rich harvest. It might have been better if, at the end of the 1966/67 series, Goddard had confirmed his retirement. In those three Test in 1969/70 he made no significant contribution with the bat, and took just six wickets, albeit inexpensively. But if he hadn’t have played in that series he wouldn’t have had the chance to be part of that crushing win, and nor would he have had the pleasure of the best seat in the house at Durban as Barry Richards went within a single stroke of scoring a century before lunch. He also managed to achieve the distinction of taking a wicket with his final delivery in Test cricket. At the time of his final retirement Goddard was working as a coach at the University of Natal and there was a certain irony in the fact that a young pace bowler he had helped to bring on, Pat Trimborn, replaced him for the final Test. Other notables who owed much to Goddard’s coaching were Procter, Vintcent Van Der Bijl and Clive Rice. Goddard’s life changed in 1970 when he, at more or less the same time as his first wife, was ‘born again’. He had always been a Christian, and had more than his fair share of exposure to tragedy. A brother died before the 1963/64 tour and on the New Zealand leg of that trip as captain Goddard had the unenviable task of breaking the news to his young teammate Peter Carlstein that a road accident back home had claimed the lives of his wife and three young children. After his conversion, in 1975, cancer claimed the life of his first wife, and it was after that, in 1977, that he left the University and threw himself full time into his Ministry. In 1985 Goddard fell asleep at the wheel whilst driving and almost died of his injuries, but after a long rehabilitation re recovered sufficiently to be able to resume his calling. Three years later he published a slim volume of autobiography, Caught in the Deep. It is, perhaps inevitably, a curious little book, but no one who reads it will be left in any doubt about Goddard’s commitment to his God or his love of cricket. Today Goddard is in his 85th year and lives in East London – as the generations slip away he is the sole survivor of the 1955 South African side for which he made his debut.